Since 2010, iMHEA, the Regional Initiative for Hydrological Monitoring of Andean Ecosystems, has worked to generate and strengthen knowledge on the hydrology of Andean ecosystems in order to improve decision-making on the management of ecosystem services and water resources in the region. 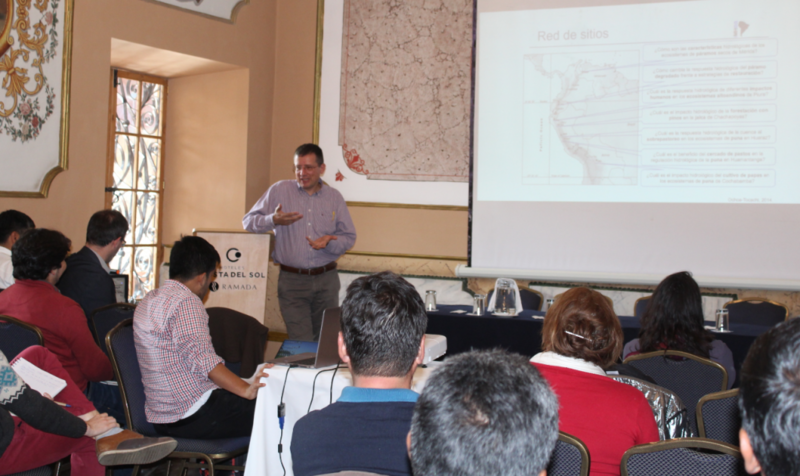 On this occasion, the iMHEA 2019 International Assembly brought together more than 40 local partners, researchers, and decision makers to learn about recent advances and reflect on challenges in hydrological monitoring of Andean ecosystems. 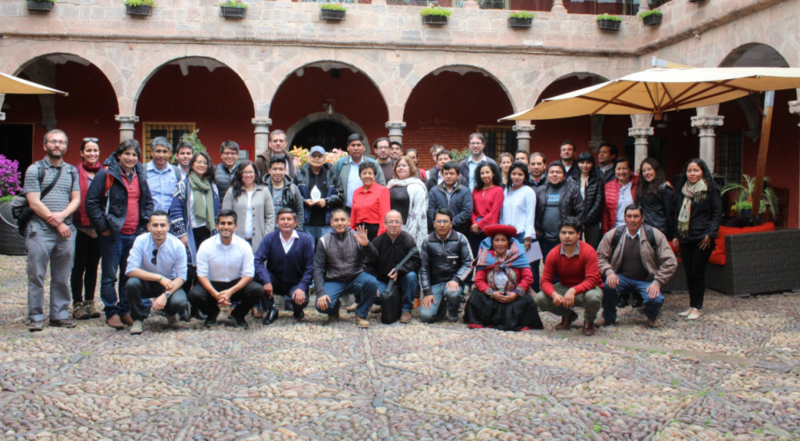 The 2019 iMHEA International Assembly took place from January 28 to 31 in Cusco, Peru. The meeting brought together more than 40 local partners and international researchers participating in the iMHEA Network. Participants represented important institutions including the Imperial College of London and the Fund for the Protection of Water for Quito, Ecuador (FONAG). Decision-makers representing multiple sectors in Peru also participated, including the Ministry of the Environment (MINAM), the National Superintendence of Sanitation Services (SUNASS), the National Water Authority (ANA), the National Meteorology and Hydrology Service of Peru (SENAMHI), companies providing sanitation services, and local non-governmental organizations. The Assembly explored a number of themes in detail, including recent work on hydrological monitoring in the Andean region; the growing acceptance of natural infrastructure strategies; and progress and challenges in knowledge generation for decision-making on water security in the region. “It is a pleasure to be a partner and ally of this initiative. It is a major innovator in generating useful information on natural infrastructure that can influence the decision-making of different sectors in the country… From the perspective of the Natural Infrastructure for Water Security Project we’re interested in scaling up results and generating useful information for decision-making for the conservation and restoration of natural infrastructure,” said Gena Gammie, Deputy Director of the Natural Infrastructure for Water Security (NIWS) project, during opening remarks at the iMHEA Assembly. “A special feature of the [iMHEA] initiative is that we work with a group local actors, who differ from place to place. There’s no rigidity…The tendency is to keep increasing [local] involvement, especially under a push from SUNASS in Peru for water companies to implement more monitoring systems,” Bert De Bièvre, technical secretary of FONAG and regional coordinator of the iMHEA network, emphasized on the first day of the Assembly. In his remarks, De Bièvre also provided the audience with an overview of key advances, complexities, and challenges for hydrological monitoring of Andean ecosystems. “IMHEA is a research network that seeks to determine through hydrological monitoring the impacts of interventions, both positive and negative, on ecosystems,” added Boris Ochoa Tocachi, an Ecuadorian researcher at Imperial College London. On the second day of the Assembly, focus shifted to the importance of engaging multiple sectors in Peru in hydrological monitoring. Analysis of the permanence of the iMHEA network’s monitoring sites has shown that many sites have lapses in continuity. This is because sites are often tied to a specific project, and when the project ends, so does monitoring, as well as management of the data collected. Activities scheduled during the Assembly included a field visit to Lake Piuray to introduce hydrological monitoring actions that have been carried out in the area, as well as natural infrastructure interventions carried out by the local sanitation service provider, SEDACUSCO, under Peru’s Mechanisms for Retribution for Ecosystem Services. The event culminated in an acknowledgement of the iMHEA network of partners as a community of practice, and with commitments by a number of institutions to install new monitoring sites in Peru. These sites will contribute to the continued production of data and scientific evidence to inform decision-making. The next iMHEA meeting will take place in Arequipa in 2020. This Assembly was made possible thanks to the support of the United States Agency for International Development (USAID) and the Government of Canada through the Natural Infrastructure for Water Security project which promotes the conservation, restoration, and recovery of ecosystems at the national level. The NIWS project works by forming alliances with public and private organizations to reduce water risks such as droughts, floods, and water pollution. It is implemented by Forest Trends with consortium partners CONDESAN, the Peruvian Society for Environmental Law (SPDA), EcoDecision, and experts from Imperial College London. Monitoring means keeping a record of one variable over time. In the case of hydrological monitoring, it refers to collecting data on elements of the water cycle, such as precipitation, river flows, lake levels, soil humidity, or air temperature. When we talk about minimum hydrological monitoring, or optimal hydrological monitoring, we refer to a monitoring system that includes at least rainfall and river flow, which can help us to understand watershed functions and how they are impacted by humans activities.